The region of Catalonia has its unique culinary customs and eating calçots are one of them. Calçots are a variety of scallion from Lleida (Lerida). The calçot from Valls, Tarragona is registered as a protected geographical indication by the European Union. They are similar to leeks, larger than a typical green onion, and milder, too. Onions are biannual plants, which mean that they need two seasons to complete a cycle of seed-to-seed production. Onion seeds that are planted in the spring will grow or “set” when the days become long enough. The bulb will then grow and die. Any onion bulb that is not harvested will lie dormant and then sprout again the following year. They don’t set bulbs, but flower and go to seed. The special method of growing the calçots interrupts this cycle. Calçots have been grown for centuries in the region. In the late 1800’s, a farmer in Valls began to cultivate them in a special way. He began covering them with earth so that the edible part does not turn green, but remains white similar to the method of growing white asparagus. In the Catalan language, that is called calçar, which means “to put your shoes on.” Harvest starts in November and continues through April. The original calçotada season was from February to March but has become so popular that the season has been extended. The most famous calçotada celebration is held in Valls the last week of January. 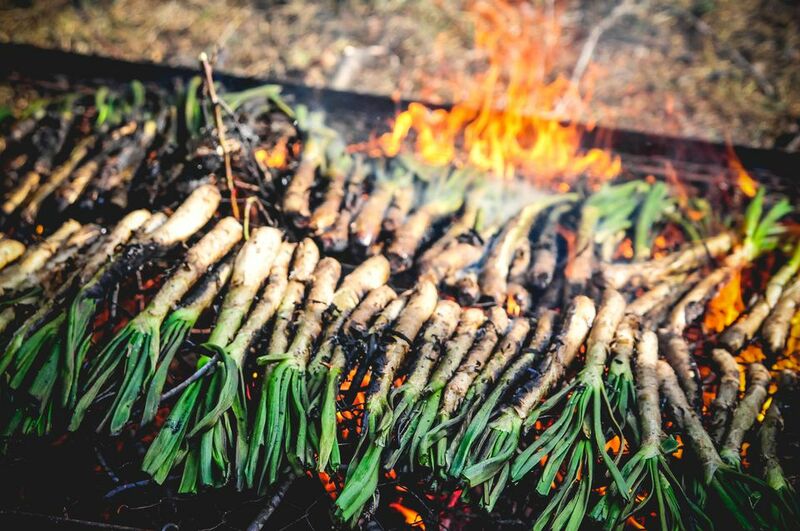 The traditional Catalan method of cooking the calçots is to grill them over a flaming barbecue. The calçots are wrapped in newspaper, which makes them tender. They are served on a terracotta roof tile, rather than a plate, keeping them warm. Diners peel away the blackened outer layers, then dip the tender bulbs in salvitxada, a sauce made of almonds, tomatoes, garlic, peppers, vinegar, and oil. Enjoy this dish with a glass of red wine. If you don’t live in the region of Cataluña, use large green onions instead of calçots. Grill them on the barbecue and serve them with salvitxada sauce.